Manny Pacquiao still wore his gaudy championship belt as he left the ring on Saturday. But this time, the crowd thought he had stolen it. The Filipino pugilist had just won a majority decision against Mexican Juan Manuel Marquez in a megafight in Las Vegas. Just about everyone in attendance  except the three judges and 60 Congressman from the Philippines who had flown in to cheer their fellow legislator to victory  thought Pacquiao had lost the fight, or maybe  just maybe  pulled out a draw. It was a close fight to score, but Pacquiao came in as a 10-to-1 favorite and everyone expected an early knockout. No man went down. Marquez landed the heavier punches. Pacquiao looked out of sync. Usually the Filipino boxer's opponents seem to hit more air than flesh when they tangle with him, with Pacquiao striking at them instead from unexpected angles. But on Saturday night, Marquez beat him to many of his own punches. Pacquiao looked tight; he lost his mouthpiece once; he was bleeding from his lip; he didn't move to his right, as his corner kept asking him to. As the fight ended, Marquez's arms were raised in victory, while Pacquiao bowed his head, looking depleted if not defeated as he knelt in his corner for his traditional postfight prayer. After the decision was announced the crowd booed relentlessly. As the Mexican left the arena, the crowd cheered: "Marquez! Marquez!" Pacquiao stood in the middle of the ring. Then the crowd turned on Pacquiao, who remained in the middle of the ring for a postfight interview. The crowd booed him. He looked crushed, like a little boy being punished. No one on press row had Pacquiao winning, and only a few had him stealing a draw. Marquez, considered the fifth best pound-for-pound boxer in the world and the reigning lightweight champion, fought Pacquiao to a controversial draw in 2004 and a just-as-contentious split-decision loss in '08. He thought he won those matches; he thinks he won this fight too. Marquez's trainer, Nacho Beristain, said, "It was a robbery of the utmost." 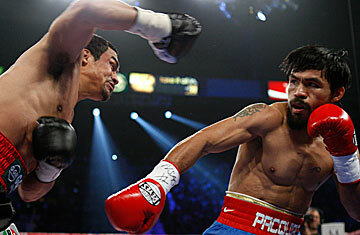 Pacquiao said, "It was clear to me I won. I clearly won." The PacMan said he blocked a lot of Marquez's punches and claimed that the Mexican fighter consistently head-butted him. The statistics put it closer than it appeared to most people, with Marquez landing 31.65% of his punches to Pacquiao's 30.79%, with the latter throwing more punches (578 to 436). And the final two rounds proved critical, with Pacquiao winning over two of the judges to eke out a majority win in what, until then, looked to be a Marquez upset. Nevertheless, Pacquiao, considered the best pound-for-pound boxer in the world, certainly looked nothing of the sort on Saturday night. "I think [Marquez] has Manny's number," said Freddie Roach, who has been Pacquiao's legendary and formidable coach for several years now, referring to the Mexican's skill as a counterpuncher." He knows how to fight Manny." What will this do to Pacquiao's legacy as a boxer? Pacquiao had become the new friendly face of boxing, a major product endorser around the world as well as a major political player in the Philippines. It wasn't his fault that the judges scored the bout his way  though the sport's less-than-savory history always raises suspicions and speculation. There will now be many doubts about his supremacy in the ring, and questions will now be ever present about his legitimacy. It may also call into question his vaunted instincts and ring smarts, his ability to improvise in midfight. After the fight, I asked Roach why Pacquiao didn't go to the body, an obvious strategy against an older fighter (Marquez is 38, Pacquiao 32). Roach said that had been the game plan but Pacquiao didn't follow it. "Manny hit him with good shots but nothing great," Roach said. "It was a win but a close win. We squeezed it out in the last two rounds." His eye heavily bandaged reportedly with 23 stitches, Pacquiao answered only two questions in the postfight press conference before leaving quickly. Pacquiao's severely dented aura of invincibility should at the very least give Floyd Mayweather Jr. less to fear. A Mayweather-Pacquiao megafight has been the dream matchup for years, each man claiming to be the best boxer alive. But the negotiations stalled over Mayweather's detailed demands for drug testing, which have led the Filipino fighter's partisans to accuse him of cowardice. Just before the Marquez-Pacquiao match, however, the American boxer, who has never fought the Filipino but who has beaten the Mexican, tantalizingly hinted that he had set aside a May date for a big fight with a yet unspecified opponent. That may be moot now that Pacquiao's promoter Bob Arum has raised the prospect of a Marquez-Pacquiao rematch (which would be their fourth meeting) in May. And that will now redound on Pacquiao, further weakening his allure. "If Mayweather doesn't fight Manny, I think it will hurt boxing," said Roach before the Marquez fight. "It's time to do it. I want the challenge. I want my fighter to be challenged." And then Pacquiao was challenged. "Mayweather is a bit of a counterpuncher also," said Roach after the fight. "He can give us trouble. We need to learn to deal with these counterpunchers better." See Pacquiao's foray into Filipino politics.